Intel is looking to shake up its "Intel inside" computer processing roots by promising innovative wearable technology at CES 2014 that'll have you wearing Intel on the outside. "Wearables is wide open," said Intel CEO Brian Krzanich to Re/code in an interview. "What you will see at CES is that we are actually going to bring some very innovative wearables to the show that are developed and manufactured here." Intel has previously confirmed that it has experimented with smartwatches in its labs, suggesting that wrist-mounted devices could be used to conveniently read text messages at a glance. It has also promised to become the competitive solution in the Internet of Things, as its technology has already made its way into heating and air conditioning units. Krzanich didn't tip his hand as to what we should expect from Intel's wearable technology, but he did hint at the processor behind it. The company is preparing a new family of Quark chips. The low-powered System-on-a-Chip is expanding from household items to all sorts of Internet of Things devices, including wearables. "Our view is that Quark can make almost everything smart," said Krzanich. "We'll show you some things that you would never have thought could become smart and communicate." 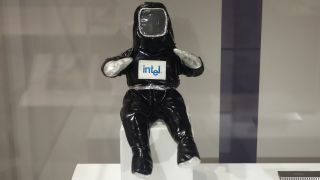 While Intel is gearing up its wearable gadgets for next week, it's also winding down its ambitious attempt to enter the pay TV market with an Intel-branded set-top box. "It is a great device and has great technology, but at the end of the day [it] is about the content you get on there," Krzanich told Re/code. Intel's set-top box efforts aren't likely to become vaporware, as the chip maker is said to be talking to Verizon to offload its TV product. Instead of playing up the TV angle, Intel is poised to develop technology that it thinks the market will be demanding several years from now. People may be interested is wearable technology soon, but the market is already crowded. Wearables with big players behind them range from the Samsung Galaxy Gear smartwatch to Fitbit Force activity wristband to Google Glass, all vying for wrist and face space. We'll have a clearer picture of where Intel will fit in the wearable world come next week. Read: Apple iWatch said to be facing major production setbacks.